Amour is incredibly powerful. It is by no means an easy film to watch, both in its subject matter and deliberately slowed down pace, but is a testament to the raw power of filmmaking, even when presented in such a minimalist way. Michael Haneke, long considered a giant of cinema, enlists Jean-Louis Trintignant and Emmanuelle Riva, both legends of French acting, in his film. The result is a heavy look at health, life, death, and love, with experienced talent both behind and in front of the camera. But be forewarned: It is emotionally demanding and quite draining. If you choose to watch it, know what you are getting into before viewing this film. Trintignant and Riva play Georges and Anne. They are retired music teachers living in an apartment in Paris. They have been married for many, many years, and their relationship is reliable and safe. The morning after viewing a piano concert performed by one of their former students, Anne suffers a silent stroke. She stops moving. She stares blankly across the table at breakfast. She does not respond to Georges. Then, as quickly as it starts, it ends. Anne is perfectly lucid, but she is unaware of what just happened. She is taken to surgery to attempt to reverse the damage, however, it is unsuccessful, and her right side is paralyzed. Confined to a wheelchair, she becomes increasingly dependent on Georges as time moves on. Her health continues to deteroriate significantly, beginning an unthinkably difficult test of their love. In his usual style, Haneke chooses to frame everything in long, quiet, and static shots. It feels like they go on for an eternity, documenting even the most mundane aspects of everyday life. Since the start of the film tells us how it ends, Haneke even uses these shots to build tension later on. We know what is inevitable, and we wait for it to get there. It’s amazing how much is said with so little in this 127 minute film. There’s also a spacial factor; Amour largely takes place within Georges and Anne’s apartment. There’s also almost no music, aside from six or seven classical piano pieces. The lack of a formal score is another choice to make the film’s aesthetic as minimalist as possible, and truly make it about the acting and story. As a result, the film has an uncomfortably intimate feeling. Haneke is less concerned with film techniques than he is showing the characters. The acting from Trintignant and Riva is the glue that holds this film together. Riva, despite becoming increasingly immobile, is painfully realistic. Anne’s suffering in the final act is almost too much to witness at times; Riva is startlingly efficient at pulling it off. Her Academy Award nomination was well deserved. Trintignant is equally good, if not better, and it is a shame that he was not also nominated for an Oscar. The character of Georges often serves as our viewpoint throughout the film, as Haneke often seems to ask us if we agree with his actions. Trintignant gives us an excellent performance with a remarkable amount of depth. Through this brilliant combination of writing, direction, and acting, I felt a strong sense of the character (despite him having some sixty plus years on me). His final actions are very ethically controversial, but this is not dwelled upon as the main point of the end of the film. It does not change its style or focus no matter what happens, and that is another part of what makes Amour such a great movie. There is a small supporting cast, most notably Isabelle Huppert, a frequent collaborator with Haneke, who plays Georges and Anne’s daughter. Huppert, who appears in a few scenes here and there, is very good at handling her character, an important but understated component of the film. For a movie to receive a four star rating, it can’t just simply exist. It must explode off the screen, leaving an impact. It can’t just be good, it must be great, proving itself to be truly unforgettable. 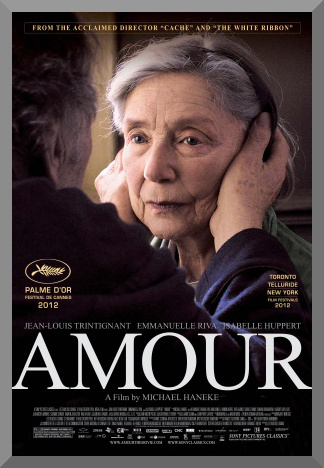 Amour addresses some difficult subjects and themes. It isn’t worried about how you feel, and instead is able to be very weighing without sentimentality. There have been few movies I have seen lately that feel so present, clear, and powerful. Michael Haneke’s Amour is a challenging but phenomenal achievement, within many realms; direction, writing, acting, etc. This is a movie that gets in your head and doesn’t go away.